Arkansas River Brown Trout? Yes Indeed! After our week in the Yampa Valley in Colorado we headed south to the Arkansas River basin near Salida, Colorado. Bo spent most of his life along the Arkansas River in Fort Smith, Arkansas, and he has always wanted to catch an Arkansas River trout. 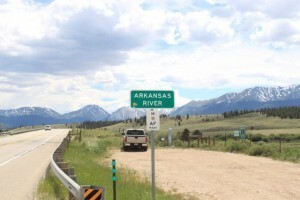 The headwaters of the Arkansas River begin high in the Rocky Mountains near Leadville, Co., where you can actually walk across the river without getting wet and after it flows nine hundred miles to the east the river at Fort Smith, Ar., is a big muddy meandering river over a quarter of a mile wide. 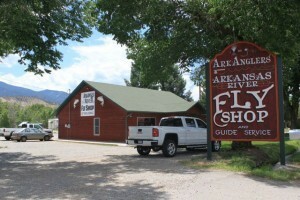 We joined up with guide, Mark Richardson, with Ark Anglers Fly Shop, in Salida, Co., to help with our quest for Arkansas River trout. Mark has been guiding the Arkansas River for over twenty summer seasons and then he heads south and guides during the winter out of Islamorada, Florida. 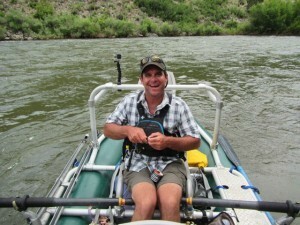 A super fly fishing guide Mark is also a real pro at rowing a white water raft and is also a Class 5 white water kayaker. Bo will tell you that there is a big difference in rowing a drift boat and rowing a raft in class 2 white water. 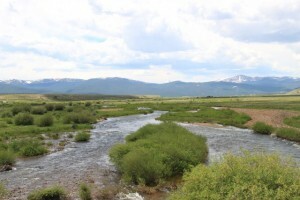 In late June and early July the Arkansas River usually flows between 400 and 600 cfs; but due to very heavy snow pack and late snow melt the river was raging at nearly 2,700 cfs making fly fishing a real challenge. This was definitely “run and gun” fly fishing. We fished Bo’s ACC Streamer, Chuck’s Chunk streamer as well as Hoppers and Stone Flys with droppers of #14 Pheasant Tails and GRHE. The name of the game was hitting the soft pocket water and the back eddies right on the river bank as Mark safely guided our raft between sections of class 2 and 3 white water rapids. 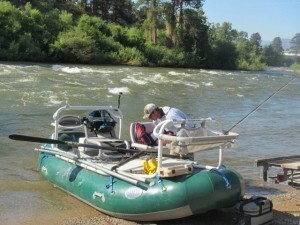 Because the flow was so big our daily floats were long and up to eighteen miles. The fishing required fast accurate casts to small soft target water; but as you can see from the photo above that definitely resulted in some beautiful, large, Brown Trout. 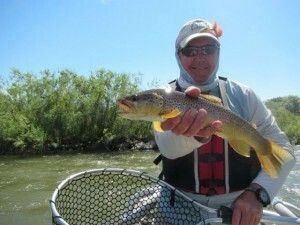 It really is rewarding to catch some good fish under quite difficult fly fishing conditions. Yes there are Brown Trout in the Arkansas River. Mission Accomplished!